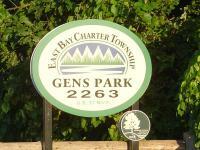 Gens Park is a .62 acre site on US 31 near Holiday Rd. right on East Bay. This park is a recent acquistion (1994) and has been the top priority on the commissions 5-year action plan since 2001. Gens offers a paved parking lot, bathhouse with flush toilets, a boardwalk to the beach and a nice beach/deck area with picnic areas and grills. Recent upgrades include a walkway through the marsh grass to the beach due to low water levels. As of October 31, Gen's Park is closed for the Season.